Women desert boots in honey color. Sweet! Your desert boots in honey color. A color that stands out from the rest and is noticeable from afar. Very wearable with denim clothing and almost any pants. Chukka boots in honey color for women (also there for men) are on our website from the beginning, because it's one of the top sellers colors since we have them for sale in stores before the web. You might think that as light color is more difficult to clean and re-let as new. Well, don't worry because following the instructions you will see on this website, will always be immaculate. 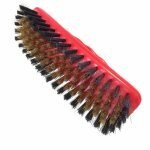 For cleaning and maintenance we recommend using our special suede brush mixed skin.